Yes! We have beach towels for guests to use, along with beach chairs and coolers. If we have a back-to-back booking (guest leaving and new guest coming the same day), the short answer is probably not, as we need time for the room to be cleaned. However, if you are concerned about luggage in your vehicle before your check-in, we can accommodate luggage to be stored until the room is ready. If we have a back-to-back (guest leaving and new guest coming the same day), the short answer is probably not, as we need time for the room to be cleaned before the new guest arrive. If there is no back-to-back and we are able to re-schedule the cleaners, we will try to accommodate you. We love to walk and hike. Are there any hiking trails nearby? There are two parks in Iao Valley, Kepaniwai Park and Iao State Park. Iao State Park has several trails people take. 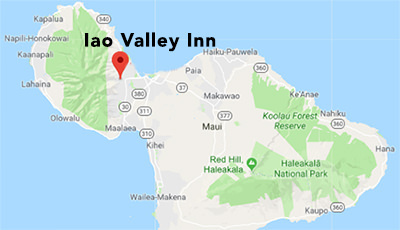 Some of our guests have even walked the 2 miles to Iao Valley State Park (500 foot elevation rise), but it is located along the road. If just short walks are more your style, our property offers areas to walk to the stream and within our boundaries. Should we expect to see bugs? We are in the tropics, so yes, there are bugs. Most are the normal ones you know about (ants, roaches and spiders) but you will also see geckos. As much as our maintenance services usually keep the bugs away, geckos are difficult to keep out. Luckily, they are harmless and beneficial by eating the smaller bugs. For the record, Hawaii does not have snakes, bears or mountain lions! You can help as well by not leaving food out. What is the protocol for late night arrivals? Because we live on the property, we generally like to greet our guests, no matter how late it is. If for some reason we are out however, finding your accomodations is fairly easy with the instructions we provide you. In that case, we will greet you in the morning. As long as you are planning on still coming, we will accomodate your change as best as possible. Usually, we have already been paid, so we will hold your funds and adjust any amount due or refund when your new dates are set. Is there a locked gate? Yes, we normally send out the gate code via email to our guests within 2 weeks of arrival. Is there a lockbox for key pick-up? We now have keyless entry locks so we normally send out the entry code via email (or text if requested) within one week of arrival. Many of your guest comments speak to the peacefulness of your Inn and your hospitality. Are we missing something? I hope not! Having just started our B&B in late 2013, we quickly found that our guests seek us and similar accommodations because they’re simply not the hotel or condo type. Our guests prefer a more relaxed setting with less people around. Iʻm sure we are not perfect, but we do the best we can! Do you help with activities? We will certainly give our personal advice if requested. We do offer a guide book in the room for ideas and we work with Barefoot Travels who can help you before your trip or upon your arrival. However, there are 2 activites that are always booked months in advance, and that is the Old Lahaina Luau and dining at Mamaʻs FishHouse. Those need to be booked early. The Orchid Room offers guests a private outside entrance and covered lanai to enjoy breakfast, reading and relaxation. 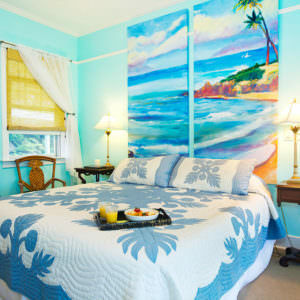 This newly remodeled room is bright and airy with elements to ensure each guest feels at home on the beautiful island of Maui. The Palms Room offers a private outside entrance and covered lanai to enjoy breakfast, reading and relaxation. 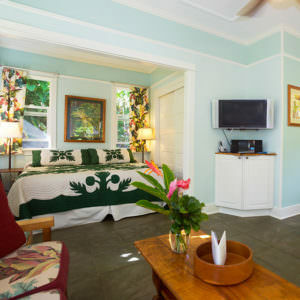 This newly remodeled room is perfectly decorated to reflect the natural beauty of Maui and allows for an intimate and comfortable stay in Hawaiian paradise. 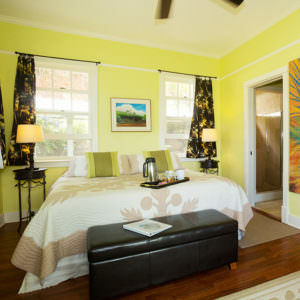 The detached one bedroom private Cottage includes direct views of Wailuku River from your bedroom window, private full kitchen, covered lanai, king size bed and bathroom with shower. Also, the octagonal gazebo offers a double bed with windows looking down to Wailuku River.